Kassidy Krupit, seen here in her club days with the East Cobb Bullets, has had a lot to smile about in her softball career. Kassidy was invited to the USA Softball Jr. National Team tryout this winter. Kassidy started at third base this fall for the Bears. 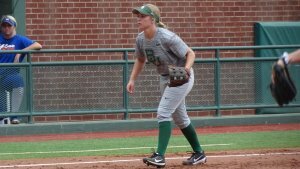 This fall, she was prepared to step foot onto the Baylor campus and compete right away for not just playing time, but a starting job as she impressed coaches and teammates with her work ethic and drive to get better. She certainly hit the ground running--she homered on the very first pitch she saw in a fall game and had two home runs in her first three games! Softball has taught me numerous life lessons. Softball’s taught me how to be competitive and come out on top in everything I do. That’s just the way I am wired. I’m extremely motivated in life in general because of softball. I believe that the harder you work, the better the reward. This sport has also taught me how to work within a team. Working with other people is one of the most, if not the most important, traits someone can obtain in life. 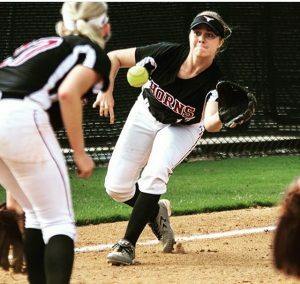 As a senior, Kassidy batted .500 with 14 home runs and a a .633 on-base percentage and in the circle compiled a 1.20 ERA with 145 K’s in 178 innings to earn her fourth All-State award. Balancing school, softball, and a social life is the hardest part about being a student-athlete. Having good organization skills and time management skills really facilitate balancing my life. These components will definitely help me succeed in life. One phrase that describes me is “always on the go.”I always have to be doing something and I feel this aspect will transfer into my college life. Even though college will be quite rigorous, I am up for the challenge. About a little under two years ago, I received a special opportunity give softball lessons to players in the community. Nothing has made me fall in love with the game more than giving back to this sport and its community! This opportunity has allowed me to open up a different view of the game and has led me to be a better overall player. My advice for girls in the recruiting process is to improve your skills, market yourself, and continue to receive good grades. There is no need to stress if you are following that process. Once a few opportunities roll through, pick the school that you have a mutuality with, where they love you and you love that institution.